After lots of training, I was excited for this year’s Climbing Works International Festival. I guess I was hopeful that I would feel stronger than I had before and would be able to hold my own and do well. Did I achieve this? Yes I think I did, but I would be lying if I didn’t admit I was a bit disappointed too. Competitions are an odd environment, you only have that 5 minutes, only you’re own beta and there is no room for mistakes. I hate the qualifying round, it is so nerve racking. I was in the team event as well as competing individually and this made a huge difference to my enjoyment of that first stage. It is much more fun going around as a group and can feel more like it’s just another climbing session at the wall. I can imagine that people may think this format is a lot less scary than the semi-final or final format but for me it is much worse. I think it’s because you only have three goes, in the IFSC format I feel more like I have had a good shot at the problem. I went into the semi-finals quite nervous – I really wanted to make the finals but was well aware that there was a strong group of girls (Shauna, Alex, Melanie, Anne-Laure, Clementine and Leah) who were also vying for one of those 6 spaces. The semi’s went fairly well for me, I flashed two problems out of four and went into the finals in third place. When the finals came round I was excited. My aims were not unrealistic – I wanted to maintain my third place. I know that Shauna and Alex are a step up from me and I was psyched to be placed just behind. The finals did’t exactly go to plan. First of all I had a nightmare on the slab, barely able to get off the floor. The second problem I flailed around on, unable to do a burly move. I was filled with relief when I topped out on the fourth, and finally the fifth just felt too hard. I ended up in fourth place, a bit frustrated but also happy to have done one of them. 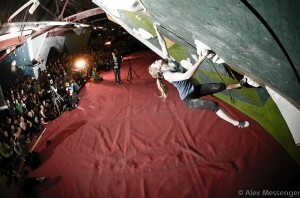 Hats of to all the girls who climbed in the finals, good efforts all round!